This isn’t writing, it’s typing. : More than a banking scandal? More than a banking scandal? The current issue of U.S. News & World Report offers a fascinating glimpse behind the curtain of the Lebanese banking world—and its ties to terrorism, money laundering and the Lebanon's Syrian masters. The article focuses on Beirut's Al-Madina Bank, which collapsed in mid-2003, leaving roughly $1 billion in depositors' assets unaccounted for. Subsequent investigation has discovered that the bank had been involved in laundering money for the Russian mafia, Saudi Islamic associations and the former Iraqi regime of Saddam Hussein. 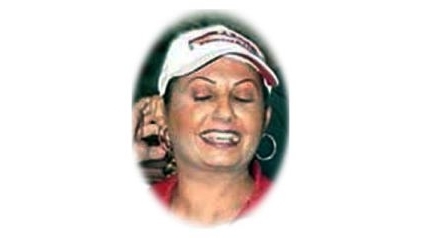 The shadiest of a large cast of shady characters involved in the scandal is one Rana Koleilat (pictured above), who—before her fall from grace—appeared to have pretty much all the officialdom of Lebanon and Syria comfortably in her back pocket. For someone who earned a salary of just $1,000 a month, Rana Koleilat managed to live a pretty nice life. She traveled by private jet, took along her servants and hairdresser, and stayed at the poshest hotels in London and Paris. Back home, in Beirut, Lebanon, she lived in a three-story penthouse. To anyone who asked how she lived so well, she replied that she had a "rich uncle." Actually, Koleilat helped manage a private bank in Beirut, and thereby hangs a tale. Two years ago, the Bank Al-Madina collapsed in scandal. At center stage was none other than Rana Koleilat. The chairman of the bank, a man named Adnan Abou Ayyash, says he lost more than $1.2 billion, and he blames Koleilat and a few cohorts. Depositors lost another several hundred million dollars. Lebanese authorities have charged Koleilat, Ayyash, and eight others in one of the biggest banking scandals in Lebanon's history. Interesting stuff, to be sure, but behind the scenes there's an even bigger story--how the bank allegedly funneled money to powerful Syrian and Lebanese officials, laundered funds for Iraq's Central Bank when Saddam Hussein was in power, and funded Hezbollah, the Lebanon-based terrorist organization. An investigation by Fortress Global—a private investigative firm hired by the bank's former chairman Adnan Ayyash—reveals numerous questionable payments by Koleilat to various officials of the Lebanese and Syrian governments. During a one-month period ending in January 2003, Koleilat used Al-Madina funds to pay $941,000 to the brothers of Gen. Rustum Ghazali, then the powerful chief of Syrian intelligence in Lebanon. Citing a confidential source, Fortress Global says that the following March, Koleilat arranged a $300,000 "donation" for General Ghazali from bank funds. She also moved $100,000, in November 2002, through an account at a sister bank of Al-Madina's to a Lebanon bank account of Mustapha Tlass, then the minister of defense and the deputy prime minister of Syria, according to Fortress Global. Its report cites other "questionable" deals. In 2002, the report says, Koleilat transferred, at no cost, a lavish Beirut apartment to a close friend of Khaled Kaddour, identified as the office manager for Syrian Lt. Col. Maher Assad. Assad is the brother of Syrian President Assad. Koleilat also used bank funds, the report said, to buy a villa from Elias Murr, then Lebanon's interior minister and the son-in-law of Lebanese President Lahoud. Koleilat paid $10 million for the property, and placed it in the name of her boyfriend, Fortress Global says. When the villa was later taken over by Lebanese authorities, the investigators say, it was valued at $2.5 million. A law suit filed by Mr. Ayyash in federal court in Manhattan also alleges that Koleilat laundered money for Saddam Hussein and helped fund the terrorist organization Hezbollah to the tune of $3.5 million. Hughes Hubbard is seeking more than $1 billion in damages in a case arising from the collapse of Lebanon’s Al-Madina Bank in February 2003. The complaint, filed in the Southern District of New York in late November, was brought under the federal Racketeer Influenced and Corrupt Organizations Act (RICO) and the laws of New York State. Plaintiff is bank majority owner and former chairman Dr. Adnan Abou Ayyash, a Saudi construction magnate with joint Saudi-Lebanese citizenship. Defendants include the bank and its affiliate, the United Credit Bank (UCB), the alleged mastermind of the fraudulent scheme (former Al-Madina executive Rana Koleilat) and John Does No. 1-10, among others. As portrayed in the complaint, Rana Koleilat acted as the ringleader of a corrupt enterprise that included her brothers Bassel and Taha, her boyfriend Moawad, her aunt Ayyas and other officers, managers and employees of Al-Madina Bank. Among the charges set forth in the complaint are that Koleilat gave at least $3.5 million stolen from the bank to "Al-Shaheed," a front organization for Hezbollah, the terrorist organization, and that conspirators laundered money through the Al-Madina Bank on behalf of the Central Bank of Iraq. Rana Koleilat joined the bank in 1985 as secretary to Ibrahim Ayyash, the bank’s general manager and brother of Dr. Adnan Abou Ayyash. In time, Koleilat rose to become a senior bank official, whose specific responsibility was to interface with the Central Bank of Lebanon. As such, the complaint charges, she "was in a unique position to execute the defendants’ scheme and conspiracy." Beginning as early as November 1999, Koleilat is alleged to have executed a series of forgeries designed to transfer funds into "dummy" accounts at the bank controlled by her and others. By November 2002, Dr. Abou Ayyash had unwittingly transferred $670 million into one such account. Eventually, Dr. Abou Ayyash would infuse an additional $470 million of his own funds into the Al-Madina Bank in a fruitless effort to avert a liquidity crisis allegedly brought on by Rana Koleilat and her cohorts. Press accounts have emphasized possible Al-Madina Bank connections not only with the former Iraqi regime but also with high-ranking Syrian and Lebanese intelligence officials. (Lebanon has for some time been a de facto Syrian protectorate.) The arrest and release on bail, in late December, of Rana Koleilat was page one news in Beirut, as was an earlier, unexpected decision—believed to be politically motivated—by the Lebanese prosecutor-general to end his probe of the two banks. The Rafik al-Hariri assassination has already shed a great deal of light on the politics of Lebanon. Expect the continuing international investigation to illuminate the corrupt world of Lebanese banking as well.